Hands On is a drawing commission by artist Lisa Milroy, specially designed for the John Radcliffe Hospital's Emergency Department in Oxford. Hands On comprises over a hundred watercolour and acrylic drawings of everyday objects, which have been photographed as an installation and were intended as a vinyl installation for a designated wall in the Emergency Department waiting area. 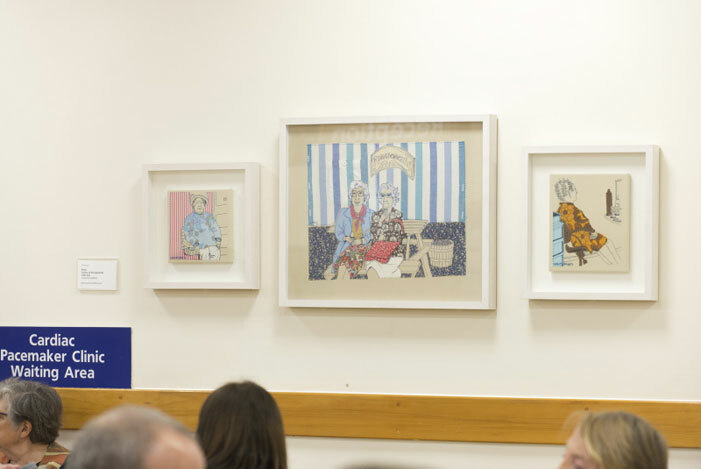 The vinyl commission is on hold until future plans for the department are agreed, but 52 of the drawings have been framed and installed in groups in waiting rooms, corridors, a nurses' station and relatives' room in the Emergency Department and Emergency Assessment Department. Single images have also been installed in some patient cubicles. It is hoped that the drawings will provide a useful talking point for patients, particularly older people with dementia. The artist has very generously gifted her work to the hospital and proceeds from sales go to Oxford Hospitals Charity to support the artlink programme. Lisa Milroy's drawings around the hospital. Artist Laura McCafferty has created new artwork based on the theme of seating - from young festival goers to older ladies playing bingo. Her work uses a collage of found textiles sewn onto careful line drawings derived from screenprints. Three views of the Oxford skyline, taken from the top of the Women's Centre are by photographer Jan Palmer, who was once a nurse in the Trust. She also created the flower images in the smaller waiting areas as well as the long strip of small images along the corridor. These photographs were chosen by Jan after asking staff to name their 'favourite things'; each photograph represents something personal to a member of staff. The Corridor Gallery in the main entrance corridor of the hospital shows a changing programme of temporary exhibitions by professional artists. Exhibitions change every six weeks to show a wide range of different work for the enjoyment of patients, visitors and staff. Most work is for sale and a percentage of profits support the Trust's arts programme. The Link Gallery is programmed by the arts organisation notfamousyet to showcase new work by young an emerging artists, as well as telling the stories behind their work and providing an insight into their working processes. The displays change through the year and show a broad range of artistic approaches. Please visit the notfamousyet website - www.notfamousyet.co.uk - for details of past exhibitions.